The price list at a gas station in Los Andes, Chile. The price of gas is always a conversation item back home. It’s probably due to a combination of the facts that prices change regularly, demand is almost universal, and consumption is continual. Plus, it doesn’t hurt that gasoline prices, being inextricably tied to the oil supply, have a political charge to them too. When I was driving, I went so far as to track fuel efficiency with a spreadsheet. Seven years ago when I started driving, gas in Utah cost about $0.90 per gallon. The spike after 2005’s hurricane season sent prices over the $3 mark. According to the Energy Information Administration (part of the U.S. Department of Energy that provides weekly average prices for gas and diesel by geographic region), a gallon of gas costs $2.35 on average in the U.S.
Here’s a little international perspective on the issue. 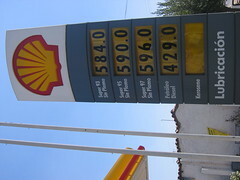 The lowest grade of gasoline at a station in Los Andes, Chile near my house costs $584 Chilean pesos. At the current exchange rate of 528 pesos per U.S. dollar, that’s $1.10. Of course, as science teachers everywhere remind their students, units matter; gas here costs $1.10 per liter. At roughly 3.78 liters to the gallon, that makes gas here $4.16 a gallon. How about two real-world comparisons? To fill your 2005 Toyota Camry in the U.S. costs $44; here, $77. Topping off a 2005 Ford Excursion costs $104 in the U.S. and $183 in Chile. If you’re waiting for me to explain the reasons for the price differences, I’m sorry to disappoint. I’m going to pull a Socrates on this one and say I’m wise enough to know that I don’t know anything about the factors that influence prices from barrels of crude oil to the pump. All I can say is that, like usual, I’d be wary of any answer that is simple. Hi Ryan, I have been enjoying seeing the Holy Cross experience through your eyes. Thanks for sharing so much of it! To appeal to common sense, when insight and science fail, and no sooner — this is one of the subtle discoveries of modern times by means of which the shallowest babbler can safely engage the most thorough thinker and hold his own.